“Jesus was broken; he is broken for us. 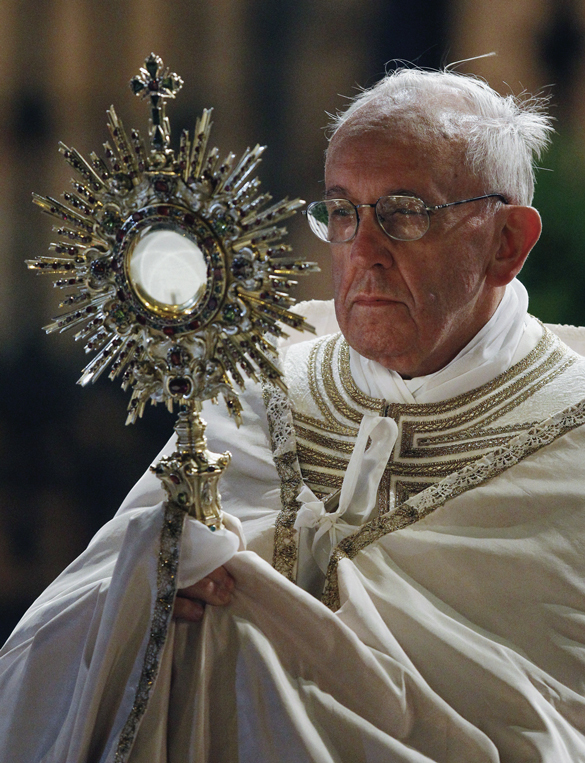 And he asks us to give ourselves, to break ourselves, as it were, for others,” the Pope said, during his homily for the celebration of Corpus Christi, at St. John Lateran. Today we celebrate the institution of the Holy Eucharist and is marked by special displays of devotion to the Blessed Sacrament, most notably Eucharistic processions. By telling his disciples “do this,” Christ gives the command to repeat his own actions by which he gave us his own Body and Blood. In the today's Gospel passage from John, which recounted the miracle of the multiplication of the loaves and fish, Christ tells his disciples to “give them something to eat yourselves.” Christ is the one who blesses and breaks the bread, providing enough to feed the entire hungry crowd, it is the disciples who offer the loaves and fish. Pope Francis said the breaking of the bread signifies another meaning of Christ's command to “do this in remembrance of me” – allowing ourselves to make sacrifices and to be broken for the good of others. He commented how “breaking bread” became a sign for recognizing Christ and Christians, and pointed to several passages in scripture recounting how the disciples broke bread together.